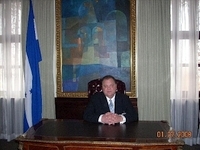 Jim Pryor at the Presidential Palace of Honduras. 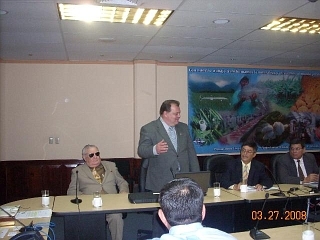 In 2004, Jim Pryor and Harold Witcher began geological studies in Honduras. This involved several field expeditions to mountain and jungle areas of the country to categorize surface rock formations in search of structural features and surface oil seeps. 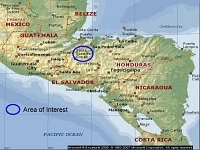 An elevated oil potential was identified in several areas of northern Honduras. A structural mapping project was completed using high altitude stereo-pair aerial photographs. The aerial mapping project confirmed the existence of very large anticlinal features that were prominent enough to have surface expression. Geo-chemical studies confirmed that multiple highly organic shale formations exist to serve as a superior source for the generation of hydrocarbons. The results of these geologic and remote sensing projects showed the potential for world class oil and gas reserves in the prospect area. A partnership was formed to include world renowned geologist Coy Squyers, and Rose Dome Energy, S.A. was created. The team, led by Jim Pryor, applied for an exploration license for 741,000 acres of prospective land for oil and gas exploration. The exploration license is expected to be finalized in 2009. Over the years of geologic work in Honduras, Jim Pryor developed long term working relationships with all levels of government in Honduras. These relationships are very important to operating in Latin America. An exploration license in Honduras requires approval by the 130 member Honduran Congress. Jim Pryor is shown in this photo with Hon. Mary Elizabeth Flores, First Vice President of the Honduran Congress, during a briefing of Congressional members. In the 2005 legislative election in Honduras, Vice President Flores received the highest number of votes cast in the country, and in January, 2006 became First Vice President of the National Congress. She served as Secretary General of the Department of Youth Development of the Liberal Party in 2000. She graduated from Loyola University in New Orleans. 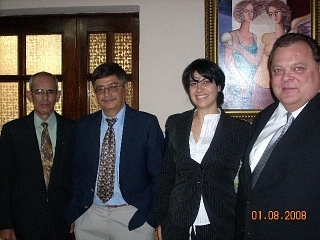 From left to right: Plutarco Caballero, Rose Dome's in-house attorney; Frederick Matute, Rose Dome's in-house petroleum engineer and general manager of Honduras operations; Hon. Mary Elizabeth Flores, First Vice President of the Honduran Congress; and Jim Pryor. Honduras hydrocarbon law allows an on-shore exploration license to be privately negotiated rather than submitted through a competitive bidding process. 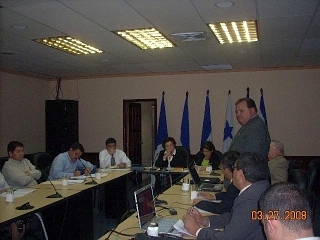 Jim Pryor served as Rose Dome's lead negotiator with the Ministers of the Energy and Environmental Ministry, and the advisory staff of the President of Honduras. 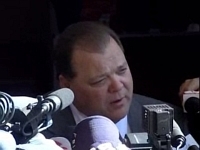 Pryor is shown in these photos during negotiating sessions. Terms of the Exploration License were successfully negotiated.